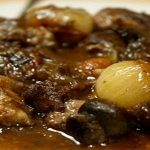 I have tried umpteen different methods for this recipe, including pre-marinating the night before etc., but this one works well and although delicious on the day, the finished article still benefits from a day or two in the fridge. Cut the meat in to 2 inch generous chunks and coat with seasoned plain flour. Chop your mushrooms in to quarters, dice the pancetta and slice the red onions thinly. Peel the small onions. I prefer to use a frying pan to fry the ingredients and then pop them into a casserole dish. I find it easier this way to seal the meat but you can do it straight in the heavy based casserole if preferred. So, over a high heat add a couple of teaspoons of oil and briefly fry the meat in batches until browned on all sides and remove. Add the sliced red onion and pancetta and brown a little (5 mins), then add a good table spoon of flour and mix well. Next add the crushed garlic but do not burn. Quickly add a small splash of wine to stop the garlic burning then add the rest gradually until it almost covers the meat. You may not need the whole bottle depending on your casserole dish. Now add the stock, herbs and seasoning and brandy , give it a stir and cook in the oven for at least 2 and a half hours. Now heat the butter in a small pan and fry the mushrooms before adding to the casserole and cooking for a further half hour. This will not suffer from additional cooking (another hour!). When ready, sprinkle with the flat leaf parsley chopped and serve with a either mashed potato and green beans or another delicious french potato dish.